from your gallery pictures or custom images by tapping on the desired color. 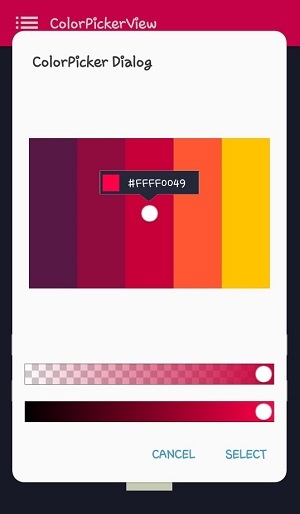 app:palette="@drawable/palette" // set palette image. Must be needed. app:selector="@drawable/wheel" // set selector image. optional. app:alpha_selector="0.8" // set selector's alpha. optional. app:alpha_flag="0.8" // set flag's alpha. optional. You can listen to only an int value of a color by using ColorListener. Or you can listen to an instance has HSV color, hex color code, argb by using ColorEnvelopeListener. onColorSelected method receives a ColorEnvelope's instance from ColorPickerView. 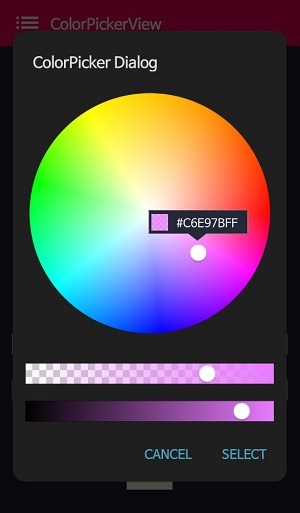 ColorEnvelope provides HSV color, hex color code, argb. You can change the transparency value of a selected color by using AlphaSlideBar. // set border size. optional. 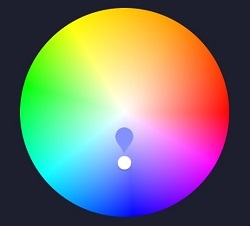 You can attach to ColorPickerView like below. 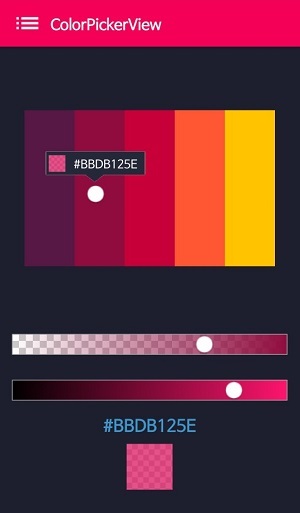 You can change the brightness value of a selected color by using BrightnessSlideBar. Can be used just like using AlertDialog and provides colors from any images. It extends AlertDialog, so you can customizing themes also. And you can get a ColorPickerView instance from ColorPickerDialog.Builder. So you can customize ColorPickerDialog. FlagView lets you can show a flag above a selector. This is optional. First, create Flag layout as your taste like below. Second, create CustomFlagView extending FlagView. This is an example code. The last, set FlagView on ColorPickerView or ColorPickerDialog.Builder. You can set FlagView's showing mode. AlphaTileView presents layout color as ARGB. If you want to present ARGB color on general views, it will not be presented accurately. because it will be mixed with the parent view's background color. So if you want to show ARGB color accurately, should use AlphaTileView. setACTION_UP(Boolean) void ColorListener only listening when ACTION_UP. 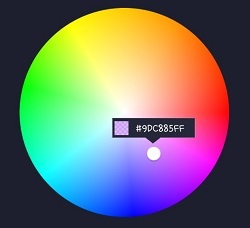 Other libraries released related to color picker! A library that let you implement ColorPickerView, ColorPickerDialog, ColorPickerPreference. You can get colors using multi selectors. At here you can get a more specialized library in multi-coloring.